Often referred to as miracle material, microfiber is one of the world’s most preferred cleaning cloths. If you haven’t yet bought into the hype, then it’s about time you did. 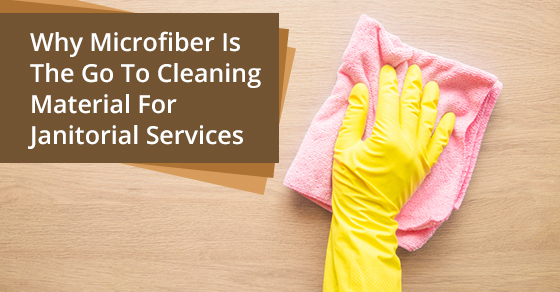 Everyone loves microfiber, especially professional cleaning companies. Let’s explore why microfiber is the industry’s preferred material for getting things squeaky clean! To understand the benefits of this synthetic material, we must first know what it’s made of. Microfiber is a combination of nylon and polyester. The fibers are actually finer than human hair. When pieced together, they create a net that traps more dirt, dust and moisture than cotton. One of the reasons behind its effectiveness is its static charge. This clinging action pulls in dirt until the fiber is eventually washed. Where can I use microfiber? Kitchen: Get all that gunk and grime off your kitchen appliances with your trusty microfiber rag and a bit of water. Stainless steel appliances will sparkle after a quick wipe down with this miracle material. You can also use microfiber for cleaning countertops, cabinets and stove tops too. Food residue, grease and oil are definitely no match for those microscopic hooks! Bathroom: Get all that mildew and soap scum off your shower tiles by giving it a good scrub with your microfiber. Dusting: Microfiber tends to trap dust particles instead of sending them airborne. You’ll also avoid chemical residue on your surfaces because all you need is a bit of water to get the job done. On your body: We know it sounds odd, but ever consider ditching the soap? Microfiber facial cloths are perfect for removing makeup and grease from your face — sans soap! Give it a try. We promise you’ll never feel this clean again. Can I use microfiber for a greener clean? Yes, microfiber is perfect for those who would like to avoid those harsh chemicals altogether. Most cleaning products contain detergents, solvents and fragrances. These things can be especially harmful to small babies and children. With microfiber however, all you need is a bit of water to remove nearly 99% of bacteria in your home and office. Cleaning with water means you can keep these nasty chemicals off your surfaces and out of the air you breathe. You’ll be saving a ton of money in cleaning products too. Because microfiber can be used over and over again, you’ll be helping the environment by cutting down on all your paper towel use. Manufacturing paper towel consumes a lot of resources including trees and water. Imagine how many of these you’d be going through to clean your windows, mirrors and countertops. Microfiber however, can be laundered hundreds of times and never lose its effectiveness. What are the additional benefits of microfiber? 1) Faster drying time: Compared to cotton cloths and sponges, microfiber dries up to 60% faster. If you have only a couple of cloths on hand, you won’t need to wait as long to use them again after washing. 2) Long-term savings: Good microfiber products cost a bit more than traditional sponges. But you will definitely make your money back over the long run, given that microfiber can be laundered and reused up to 500 times. How can I take care of my microfiber cloths? To ensure the effectiveness and durability of your microfiber cloths, they must be washed properly. Two big things to avoid is fabric softener and laundry detergent. Chemical products can actually be harmful to the microfibers and destroy their magnetic ability to attract dust and bacteria. Although it may seem counterintuitive, all you truly need to wash microfiber is water. Nothing else. Always remember to wash microfiber on its own. Cotton for example, should never be mixed in with a load of microfiber towels. Wash on a cool setting with no detergent. Once the cycle is done, let your microfiber air dry or throw in the dryer on the lowest possible setting. If you’re tired of cleaning your home or office with harsh chemicals and dirty cotton rags, consider switching to microfiber instead. Millions of people can’t be wrong about this ‘miracle material’. For immaculate surroundings, invest in a set of high-quality microfiber products that will give you an excellent clean and lasts a lifetime!